The kernals almost all poped and size was what I like not to small or big with no flavor. I gave some packages to neighbors who live alone since I had tried so many. Almost all told me the liked the size and flavor. With so many brands you become spoiled, and of course I have a different favorate Would I order this again? Yes. So many people liked them and as I stated there really was not a problem. I guess I can say it is like the original popcorn , most of us grew up with. Good popcorn and a reasonable price. Non GMO, which I favor. After I got the order for the second time, It was fine. The first order was damaged. Great tasting popcorn. Only issue is the container arrived broken so we had to transfer the contents to something else. Other than that no complaints! Just used this popcorn for the first time. Stove top, 2.5 tbls of melted coconut oil, 1 cup kernels and salt to taste made an AMAZING bowl of popcorn. Very tender kernels! This popcorn is delicious and I'm so glad that is not GMO. Another plus, is that is grown on a small family farm. Really like this popcorn! We pop our own on the stove and like the white kernels. This is very tender. Will buy again! Excellent popcorn-better than Orville and better price! This is without question the best popcorn I've ever tasted. Very few uncooked kernels. Great taste. I will be ordering more when I run out which will happen prett soon. Best popcorn ever. Tender with no old maids. Great price and delicious product. 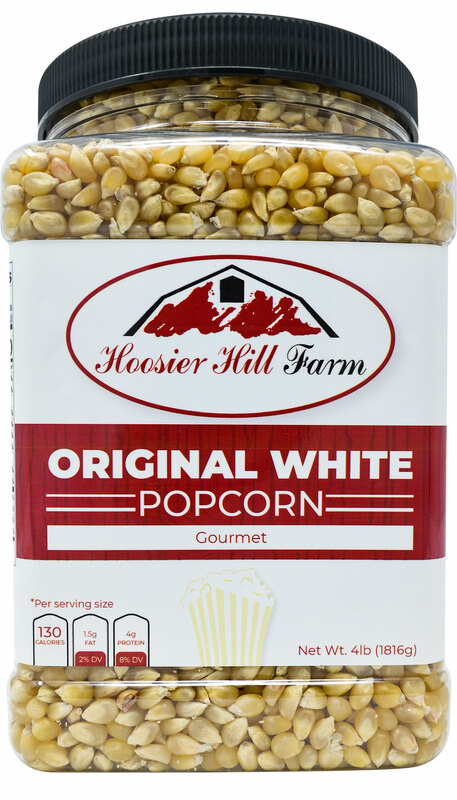 Works perfectly in my hot air popper and my snack cravings are never disappointed when I make Hoosier Hill White Popcorn. Advantages: Tasty and versatile White Popcorn! We already tried this popcorn in our microwave popper. Tastes great. Slightly sweet taste. As a Hoosier & popcorn lover (popping it old school in hot oil), I was delighted to find this delicious white kernel corn. It pops fully, hot and fluffy every time. I'll be back for more! Fluffy, pops well, has a full popcorn taste! My favorite nighttime snack! Outstanding flavor. Pops extremely well in a microwave popper, with few kernels left unpopped. Medium large pop, with above average yield. This reminds me of the popcorn I used to eat when I was a kid. Highly recommend this over store bought! IMO, this is the best white popcorn that I have found. Hoosier Hill Farm Blue Raspberry Rock Candy Crystals, 1 lb. I got a lot for the price. Used as a decoration for a breaking bad cake. It was a big hit!